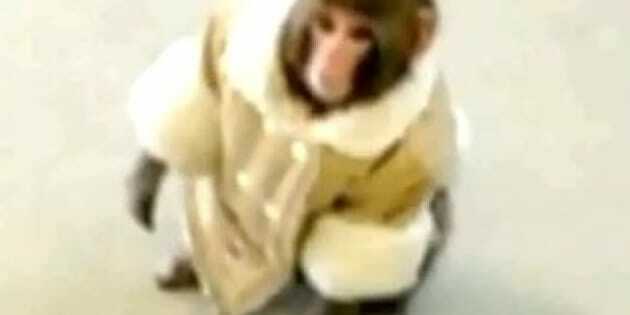 TORONTO - The Ikea monkey is in the market for a new home and is looking for help purchasing it. Darwin the monkey — who sparked a social media frenzy in December 2012 when it was found wandering outside an Ikea store in Toronto wearing a shearling coat — has been living at Ontario's Story Book Farm Primate Sanctuary ever since a court placed him in its care. The sanctuary in Sunderland, Ont., east of Toronto, is now hoping to relocate to a new property by the spring of 2015 and has launched an online crowdfunding campaign that aims to raise $490,000. Darwin features prominently in the sanctuary's call for funds but the establishment notes its larger new home will also cater to 41 other monkeys. The monkey became something of an international sensation after it escaped from a crate in its owner's car in the Ikea parking lot. Images of Darwin wearing a tiny beige shearling coat as it wandered all the way into the store quickly went viral. Animal services seized the monkey and sent it to Story Book Farm, prompting its owner, Yasmin Nakhuda, to sue the sanctuary in an effort to get it back. An Ontario Superior Court justice then ruled that Darwin is a wild animal and that Nakhuda's ownership ended with its escape from her car. Nakhuda decided to appeal the ruling but abandoned her effort, saying it was too costly and had little chance of success. The founder of Story Brook Farm has said that Darwin's story focused needed attention on the sale of exotic animals as pets in Canada. The sanctuary says Darwin has now grown into a "much larger, energetic and rambunctious juvenile." It says its new home will have wide open spaces and forested enclosures for Darwin and its fellow sanctuary residents. A $10 donation to the fundraising campaign yields a "virtual kiss" from Darwin in the form of a video and an e-note, a $200 donation nabs a tour of the sanctuary and $500 results in five visits to Darwin in one year. The online campaign was launched on Tuesday and had raised about $3,400 by Thursday afternoon.